Trong bài sau, các tác giả, Dr. Lawrence Crum và Dr. Michael Bailey ở Applied Physics Laboratory tại University of Washington (APL-UW; Seattle, USA), với kết quả mô hình hoá tác động siêu âm Doppler trên sỏi thận, cho rằng lực bức xạ âm (acoustic radiation force, ARF) là một trong những yếu tố của cơ chế tạo ra xảo ảnh lấp lánh (twinkling artifact). Cơ chế này hiện còn chưa rõ, dù đã có vài giả thuyết đã công bố trước đây. Yêu cầu của nghiên cứu xuất phát từ nhu cầu điều trị sỏi thận cho phi hành gia trong không gian: không thể uống nhiều nước và ảnh hưởng của tình trạng phi trọng lực. Các tác giả cho biết là sỏi khoảng 1/2 milimet sẽ bị dời chỗ dưới tác động của lực bức xạ âm tới chỗ thoát của thận, với tốc độ 1 cm mỗi giây; ứng dụng này như vậy còn có thể được áp dụng cho việc làm sạch các mảnh vỡ sau tán sỏi trong trường hợp điều trị trên mặt đất. Đây là một ý tưởng mới về cơ chế tạo ra xảo ảnh lấp lánh. Space scientists are developing an ultrasound technology that could resolve various healthcare challenges associated with kidney stone treatment. 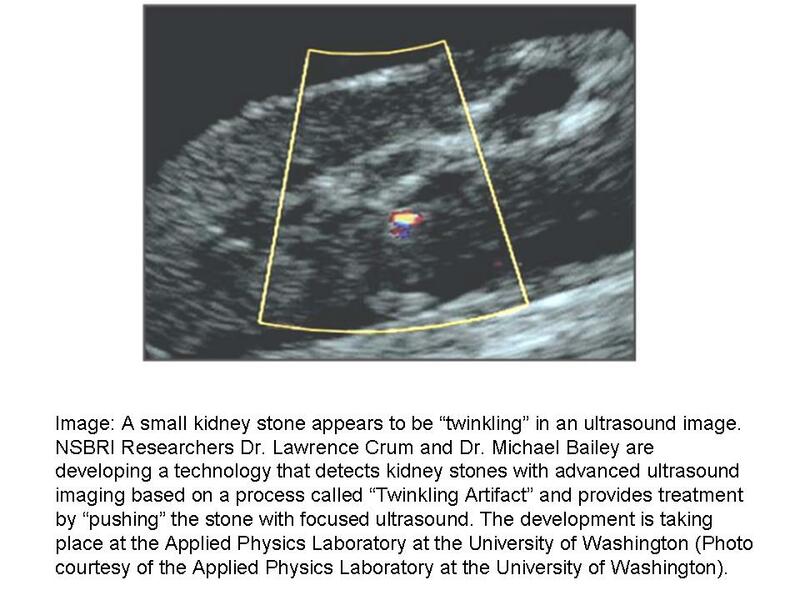 The new technology detects stones with sophisticated ultrasound imaging based on a process called twinkling artifact, and provides treatment by pushing the stone with focused ultrasound. This technology could not only be beneficial for healthcare in space, but could also transform the treatment of kidney stones on Earth. Kidney stones are frequently painful and sometimes difficult to remove, and 10% of the population will suffer from them. In space, the risk of developing kidney stones is exacerbated due to environmental conditions. The health risk is magnified by the fact that resource limitations and distance from Earth could restrict treatment options. The project is led by US National Space Biomedical Research Institute (NSBRI; Houston, TX, USA) smart medical systems and technology team lead investigator Dr. Lawrence Crum and coinvestigator Dr. Michael Bailey; both are researchers at the Applied Physics Laboratory at the University of Washington (APL-UW; Seattle, USA). On Earth, the current preferred removal method is for patients to drink water to force the stones to pass naturally, but this does not always work, and surgery is frequently the only option. In space, the threat from kidney stones is greater due to the difficulty of keeping astronauts fully hydrated. Another factor is that bones demineralize in the reduced-gravity environment of space, dumping salts into the blood and eventually into the urine. The increased concentration of salts in the urine is a risk factor for stones. Before a stone can be pushed, it needs to be located. Conventional ultrasound units have a black and white imaging mode called B-mode that creates an image of the anatomy. They also have a Doppler mode that specifically displays blood flow and the motion of the blood within tissue in color. In Doppler mode, a kidney stone can appear brightly colored and twinkling. The reason for this is not known; however, the scientists are working to understand what causes the twinkling artifact image. NSBRI’s research range includes other projects seeking to develop smart medical systems and technologies, such as new uses for ultrasound that provide healthcare to astronauts in space. Dr. Crum, who served eight years as an NSBRI team leader, noted that the innovative approaches to overcome the restrictive environment of space could make an impact on Earth. A Doppler mode in clinical diagnostic ultrasound detects motion, particularly blood flow, and displays the moving blood as red or blue on the imager's screen. 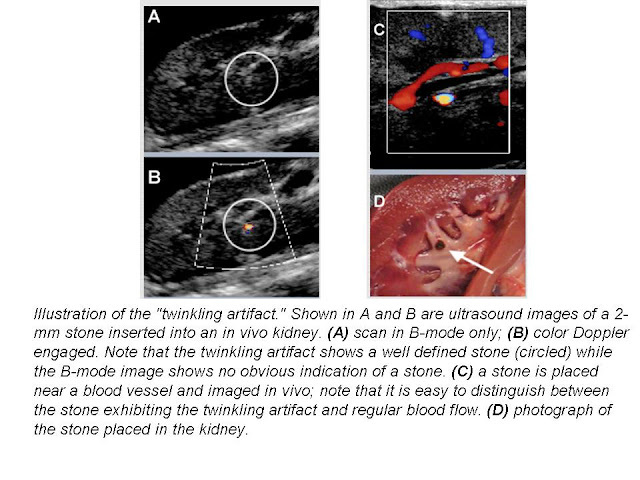 For some unknown reason, when a stationary kidney stone is imaged in Doppler mode, the stone is displayed as a rainblow of colors, which makes the stone readily apparent. Something about the presence of the stone tricks the machine into displaying the color, which is an artifact because the color does not represent true motion. Because twinkling is an artifact, its appearance can be intermittent and unreliable. The unreliability is exacerbated because of the variability of ultrasound imager proprietary technologies. 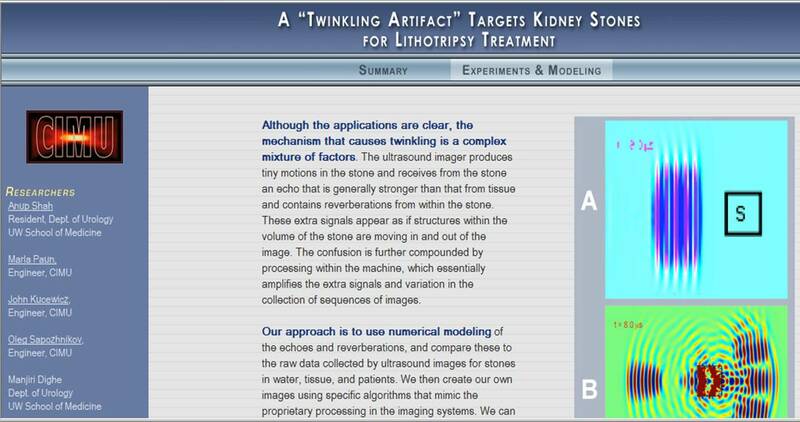 We are focused on how to understand the artifact and make it into a useful tool to detect and treat kidney stones with lithotripsy. We see at least three applications of the "twinkling artifact" to kidney stone treatment. First, stones are usually diagnosed with spiral CT imaging, which cannot be done in a doctor's office and exposes the patient to ionizing radiation. Our ultrasound technique would allow an immediate localization in the doctor's office and spare the patient the radiation exposure. Second, most stone are treated by lithotripsy, where shock waves are sent into the patient's body to break stones. Most often X-ray fluoroscopy, which is generally not as good as spiral CT, is used to find the stone to target the treatement. These images are not always clear and sometimes the lithotripsy is done based on a best guess as to the stone's location. Twinkling could provide better targeting without the X-ray radiation. Third, the stone moves as the patient breathes during lithotripsy treatment, which mean that about half the shock waves miss the stone and impact only kidney tissue. Lithotripsy has known side effects (i.e., tissue injury) and the fewer shock waves used the fewer side effects. 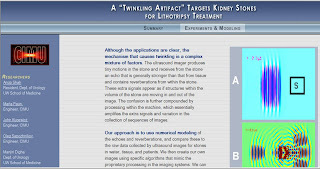 Twinkling is a sensitive and real-time stone detector that could be used to ensure shock waves are only triggered when the stone is in the lithotripter's focus. Although the applications are clear, the mechanism that causes twinkling is a complex mixture of factors. 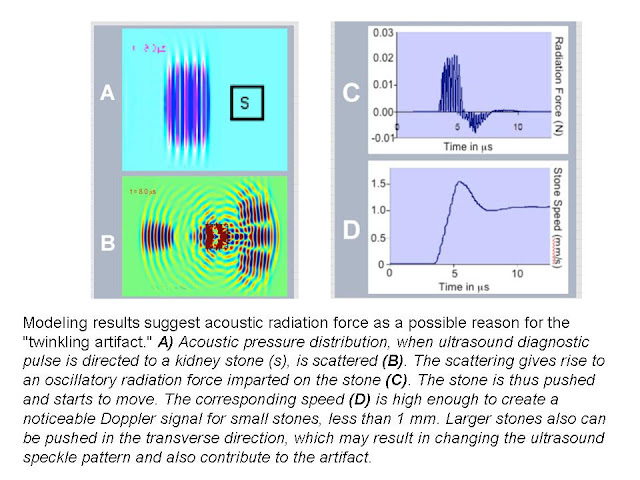 The ultrasound imager produces tiny motions in the stone and receives from the stone an echo that is generally stronger than that from tissue and contains reverberations from within the stone. These extra signals appear as if structures within the volume of the stone are moving in and out of the image. The confusion is further compounded by processing within the machine, which essentially amplifies the extra signals and variation in the collection of sequences of images. Our approach is to use numerical modeling of the echoes and reverberations, and compare these to the raw data collected by ultrasound images for stones in water, tissue, and patients. We then create our own images using specific algorithms that mimic the proprietary processing in the imaging systems. We can generally recreate what is shown on the imagers and detect patterns that are used to specifically image just stones and not motion. In our experience, the artifact reveals the stone in 100% of the animal studies and has performed reliably in an initial handful of human studies.